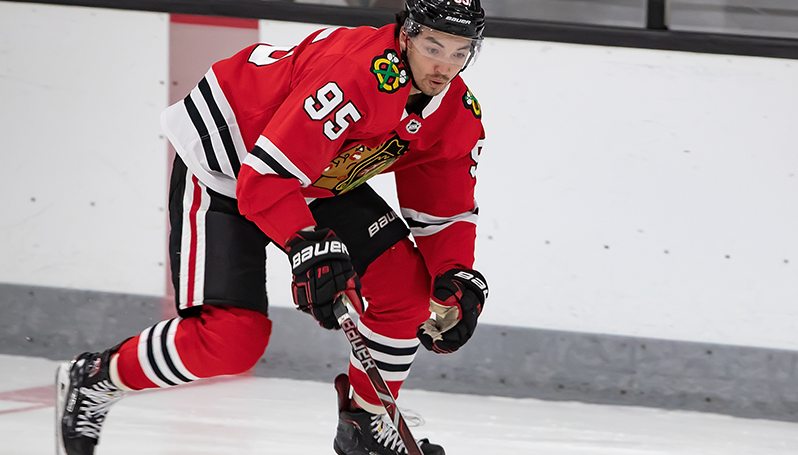 TRAVERSE CITY, Mich. – Dylan Sikura wristed a shot into the back of the net with less than two minutes remaining in overtime to send the Chicago Blackhawks prospects to a 4-3 victory over the St. Louis Blues Monday night in Game 3 of the 2018 NHL Prospect Tournament at Centre Ice Arena. Chicago netminder Chase Marchand sent the contest to overtime with a clutch save on a shorthanded breakaway with just 30 seconds left in regulation. In overtime, the Blackhawks created several scoring chances before Sikura took advantage of an open look and lasered in the game-winner with an unassisted tally. The marker gave Chicago’s prospect a point in each of his first three contests in the tournament. The Blackhawks cruised early against St. Louis, mounting a 3-0 lead through the first two periods of play. Graham Knott found twine first, capitalizing on confusion in front of the net to deflect a puck past Evan Fitzpatrick at 7:46 in the opening frame. Nathan Noel followed Knott when he cleaned up in front of the net on a wraparound attempt from Jason Willms. The puck slid in front of the crease and Noel skated in and tapped in the puck for his first goal of the tournament. Willms then potted a goal himself, burying a centering feed from Philipp Kurashev for a 3-0 Chicago lead. St. Louis rallied with three unanswered tallies to tie the game and force overtime, but Marchand finished off his debut with 13 saves to preserve the victory for the Blackhawks. His counterpart, Fitzpatrick, turned aside 37 of 41 shots in the defeat for the Blues. Chicago’s prospects finished second in pool play in the Gordie Howe Division and will now take on the Minnesota Wild Tuesday at 5:30 p.m. CST in the third-place matchup. The championship game begins at 6 p.m. CST tomorrow and features the top seeds from the Gordie Howe and Ted Lindsay Division in the Columbus Blue Jackets and Detroit Red Wings.